Slightly more than a week has come to pass since the launch of Pokémon GO, and there has been a frenzied movement of players of all ages who are desperately trying to catch ’em all. 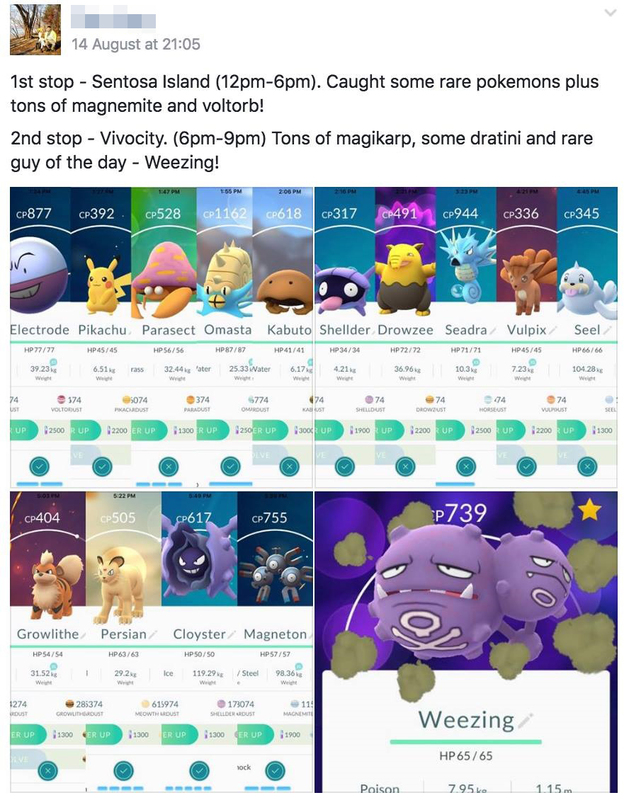 I dug through the depths of social media to bring you some possible places of interest that you may want to pass by on your way home today to catch some rare Pokémon. Marina Bay Sands is slowly turning out to be a Pokémon hotspot in its own right. 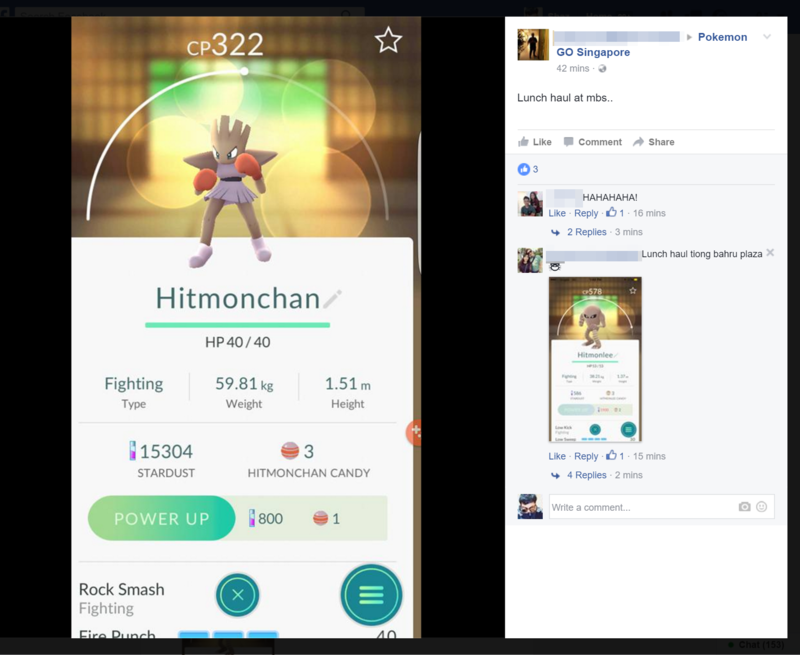 This time we have a Hitmonchan that was caught earlier this afternoon by a guy who was simply out for lunch. 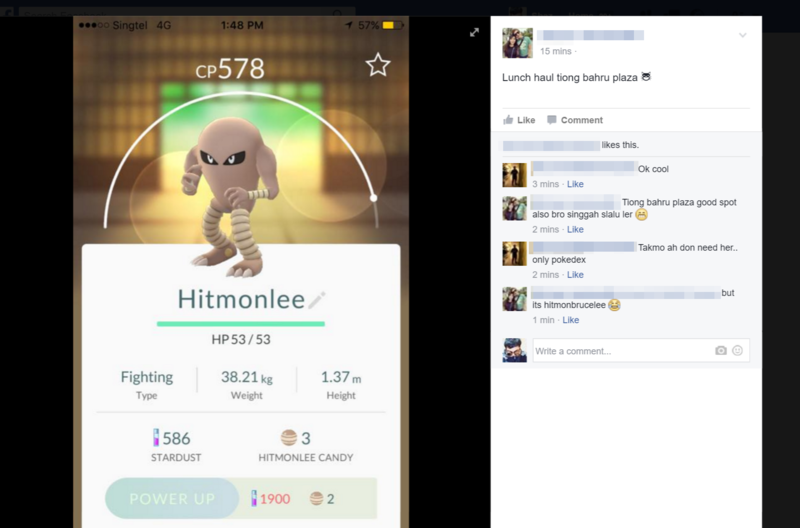 In a double whammy of the martial arts Pokémon, another player commented that she has caught herself a Hitmonlee at Tiong Bahru Plaza. I wasn’t kidding when we said that Marina Bay Sands is turning into a Pokémon hotspot in its own right. 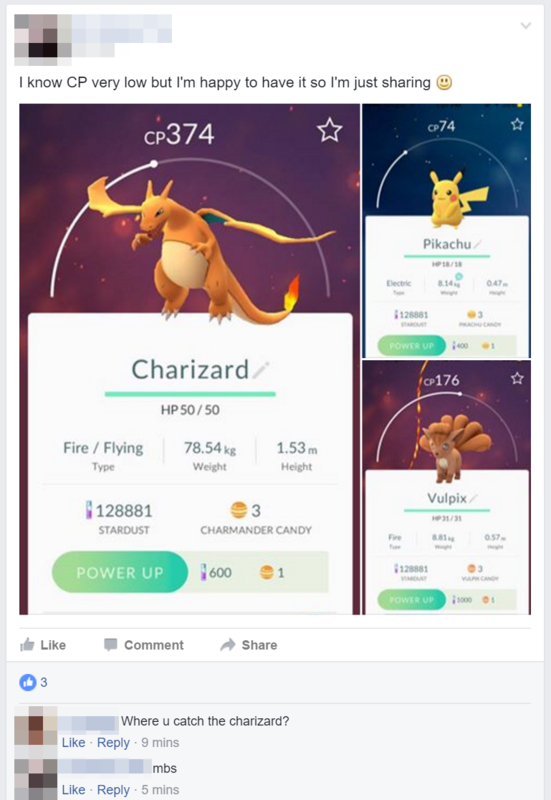 I know of a friend who managed to catch a Charmeleon here yesterday, and guess what? 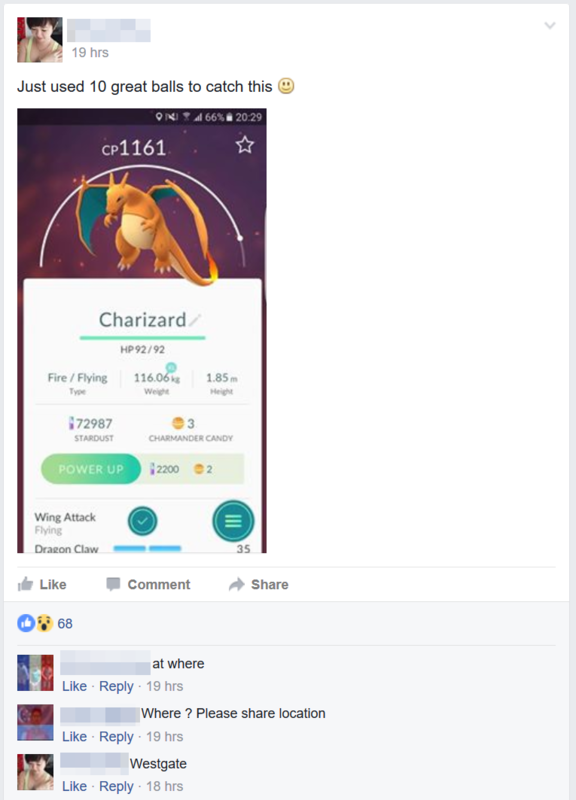 Some guy managed to bag a Charizard at the same location, though with a low CP. 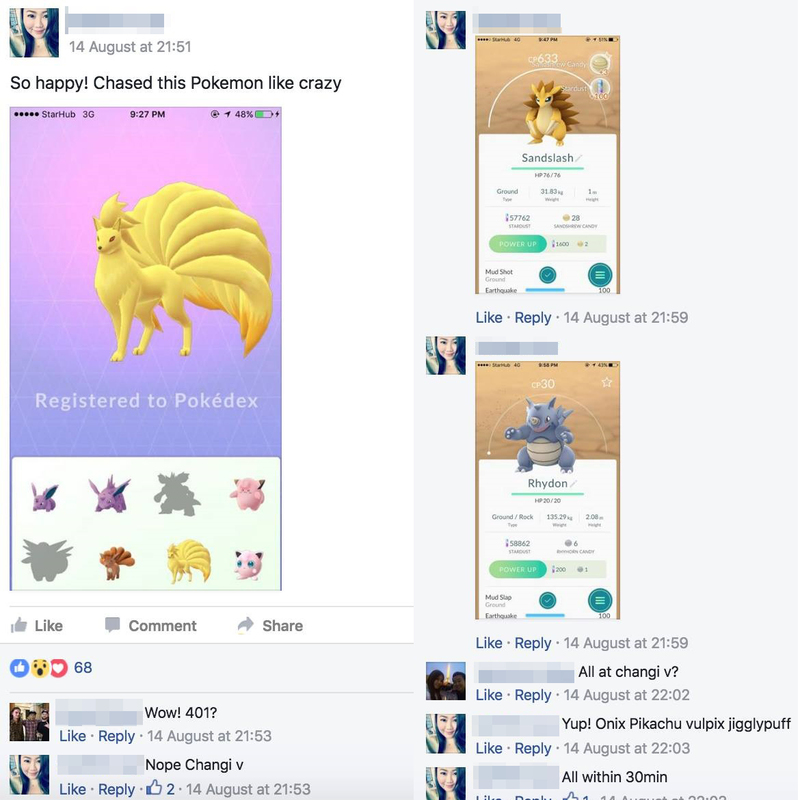 Along the way, he also caught himself a Pikachu and Vulpix. Not bad for a lunchtime outing. If you live in the west, there is also a reported sighting over at Westgate. Seems like lots of players are reaping the good stuff over lunch. This time it’s a Blastoise, and it is located at Lot One shopping center, located next to Choa Chu Kang MRT. 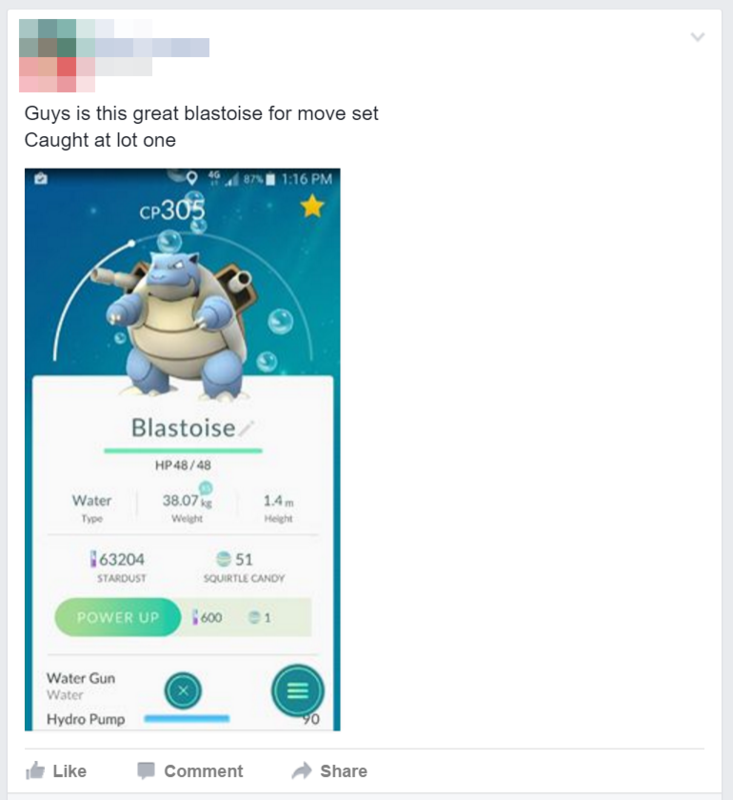 Blastoise sightings have increased a lot in the north-west of Singapore, as I also know of someone staying in the West even managing to capture one at home! I’ve only ever seen horseshoe crabs on the beaches at Punggol End. 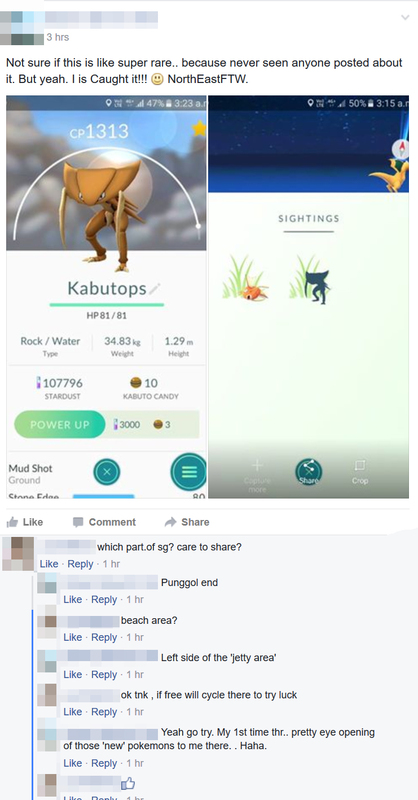 Well for this guy, he found himself a Kabutops. 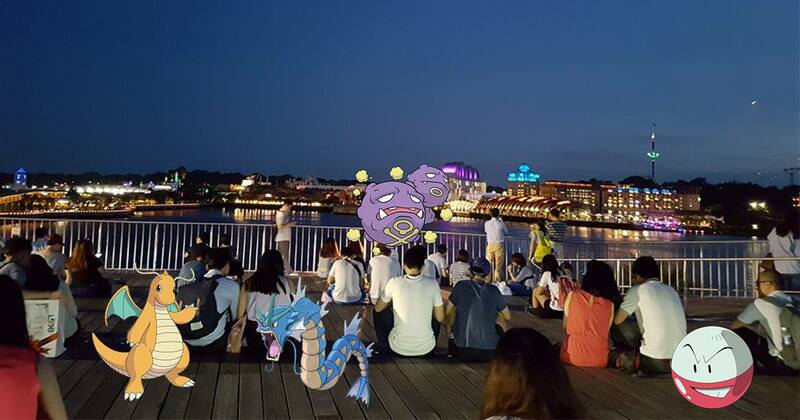 Vivocity is also another prominent Pokémon hotspot, with its rooftop decks constantly filled with players hoping to land a rare Pokémon or two. Here is also where a reported Magikarp nest lies, so it is not entirely unexpected that you will encounter a Gyarados. One player did so today, after having spent the weekend there too. Another fruitful lunchtime player managed to stumble upon an Arcanine at Mohamed Sultan Road. 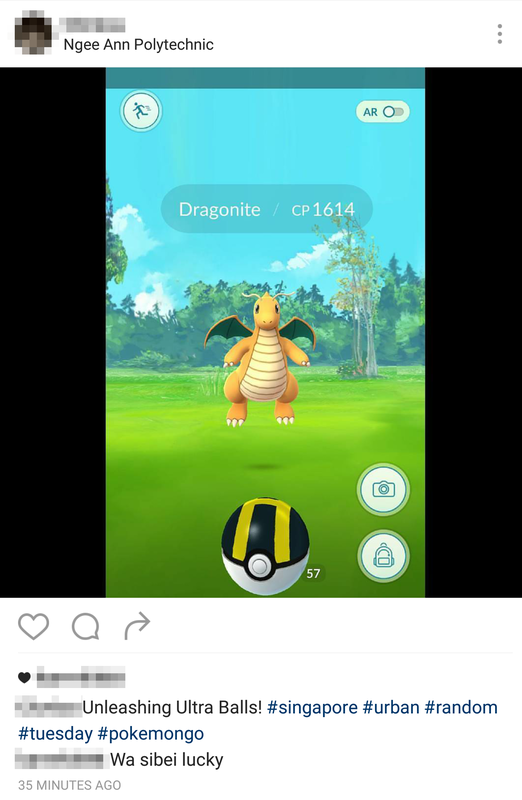 I can only imagine the scene at Ngee Ann Polytechnic when this Dragonite appeared. Here’s the freshest one out of the oven at the time of this writing. 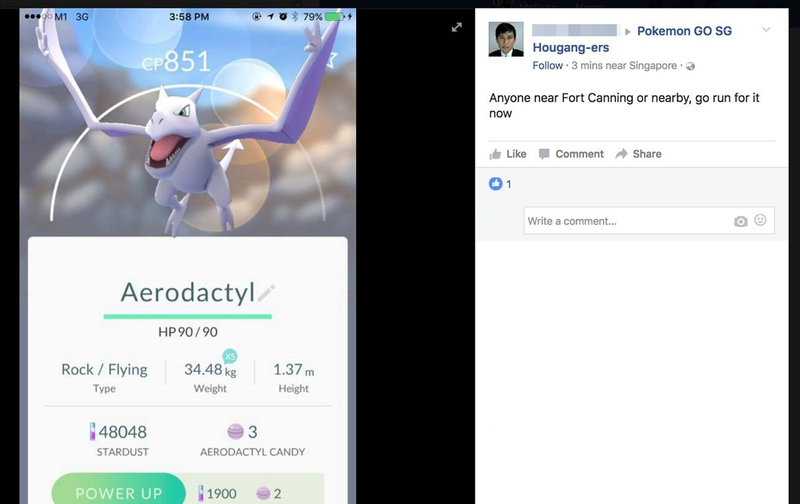 This player bagged himself an Aerodactyl while out in the afternoon in Fort Canning Park. If you’re nearby, it might not be too late. Not exactly in the last 24 hours but I feel that this deserves some spotlight. 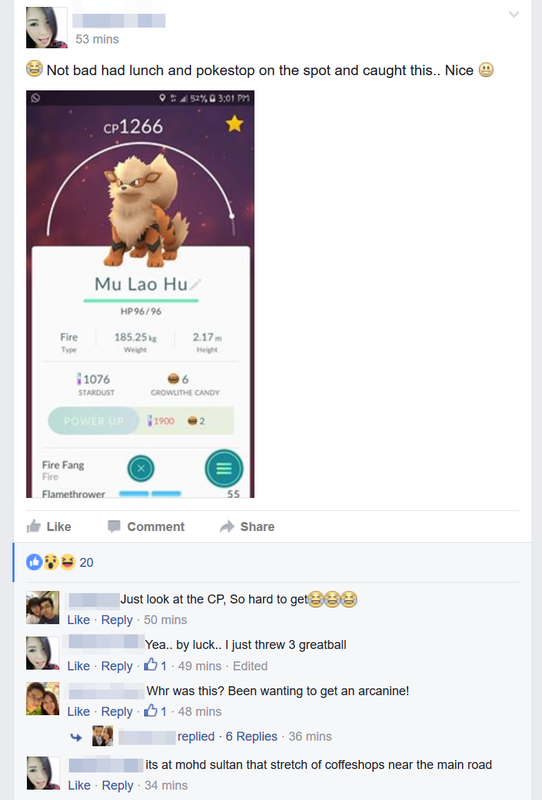 We all know that Vivocity is definitely a hotspot that players should go to, but until now, we never knew the gravity of how much you can actually catch there. This player probably had the haul of the day. 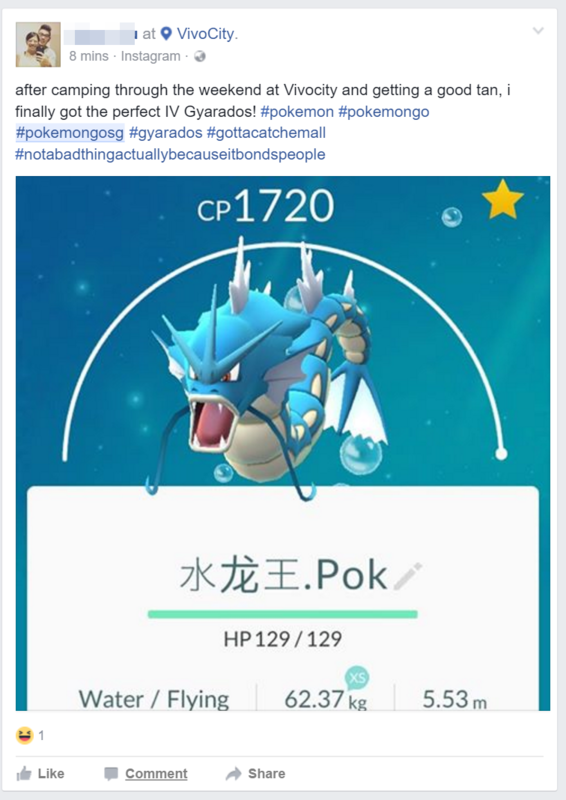 His journey included both Sentosa and Vivocity, and what he had added into his Pokédex includes some rare catches with respectable CP. With all the news about hotspots appearing in the North, like Yishun Park, and the West, like Chinese Gardens, and South with Vivocity, residents in the Eastern part of Singapore have a good reason to feel left out of the race to become a Pokémon Master. No more will that be the case, as it looks like the East has found itself a treasure trove of Pokémon, and it is located in none other than Changi Village. Well this player is definitely a happy camper as her hauls included Ninetales, Sandslash, Rhydon, Onix, Pikachu, Vulpix and Jigglypuff. Easties you know where to head to now, and do remember to grab some of that famous nasi lemak while you’re in the area.